Anthony Browne, 1st Viscount Montague. The basic facts of the rift between Henry Wriothesley, 2nd Earl of Southampton and his wife Mary (daughter of Anthony Browne, 1st Viscount Montague) are pretty much as Gib’s uncle says. Their marriage disintegrated in late 1579/early 1580 when the Earl heard that the Countess had been seen with a “common fellow” named Donesame (?) at Dogmersfield, where the Earl was building an impressive house to add to his collection. The Earl was already suspicious about his wife’s relationship with Donesame, and had forbidden the Countess to see him. Detailed accounts of the rift are in the biographies of their son (Gib’s lord) by Charlotte Carmichael Stopes and G.P.V. Akrigg. The contemporary source is an impassioned letter written by the Countess to her father, Lord Montague. The Earl had also told her that there was no point in complaining of her treatment to the Queen, who wouldn’t be interested. The Countess wanted to have her case heard by some of the Queen’s council. Mrs Stopes’ transcription of the letter is printed in the Addenda to her biography. She accepts the Countess’s side of the story, and speculates that the Earl’s suspicions and hostility resulted from his ill health. He died in October 1581. G.P.V. Akrigg notes that Mrs Stopes’ transcription contains a number of misreadings. He doesn’t provide his own transcription, or say how significant her misreadings are, but does point out that with so little evidence it’s impossible to reach any conclusion. However, his view of the Countess is consistently unfavourable, and seems to have caused him to misinterpret, to her detriment, later letters she wrote on entirely different topics. Gib’s investigations are not much help. He looked for facts in Bevis of Hampton, a medieval work of fiction, and was carried away by a few coincidences. However, he may have stumbled onto something when he later wondered if a gentleman had dropped a maggot in the Earl’s ear. Thomas Dymock is one suspect. Another might be the intriguing Charles Paget (c.1546–1612). Mrs Stopes and G.P.V. Akrigg note a couple of contemporary references to Paget as the cause of the Southamptons’ separation. 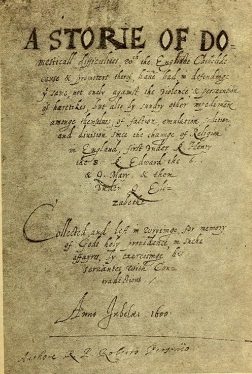 Title Page of Fr Persons’ Manuscript. One is from Robert Persons S.J. 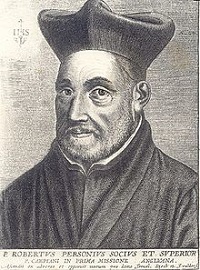 He blamed Paget and his associate Thomas Morgan, Mary Queen of Scots’ representative in Paris, for sowing dissension at every level within the Catholic community. 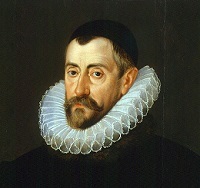 Sir Francis Walsingham, at the opposite end of the religious and political spectrum, also considered Charles Paget dangerous. But, to be fair, Sir Francis and Fr. Persons had their own, very different, reasons for their hostility. Charles Paget was the younger son of a recently ennobled Catholic family; his father was the 1st Baron Paget. Charles was about the same age as the 2nd Earl of Southampton, and obviously a close friend. 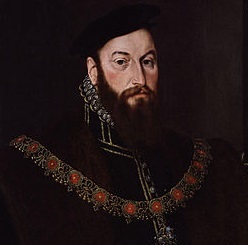 In 1581 he was named as a chief executor of the Earl’s will along with Thomas Dymock. By then he was in France embarking on a career as one of Mary Queen of Scots’ agents. In the late 1570s Charles Paget may have thought that the 2nd Earl of Southampton would be more useful to the Catholic cause in England (including supporting an armed invasion?) if he were to be estranged from his wife and father-in-law, who could have been restraining influences. Viscount Montague, although a prominent Catholic, seems to have been more careful of his behaviour than his son-in-law was. Alternatively, Paget may have crossed Robert Persons because he thought that the more militant Jesuits (of which Fr. Persons was one) were endangering, rather than advancing, the Catholic cause in England. Or perhaps he just liked playing dangerous games, and the exercise of power and control over others? Or been motivated by a mix of all of the above? There’s also the question of status in a profoundly status-conscious society. If the Countess had been accused of dallying with a nobleman, or even a gentleman, would the Earl have responded in quite the way he did? Whatever, the rift between the 2nd Earl of Southampton and his Countess may have been less about adultery than it was about the climate of the time.